I've never gotten code coverage to work in IDEA 6 (using the pre-release or the latest revision: 5784) on OS X (10.4.8 running latest Java 5 build). 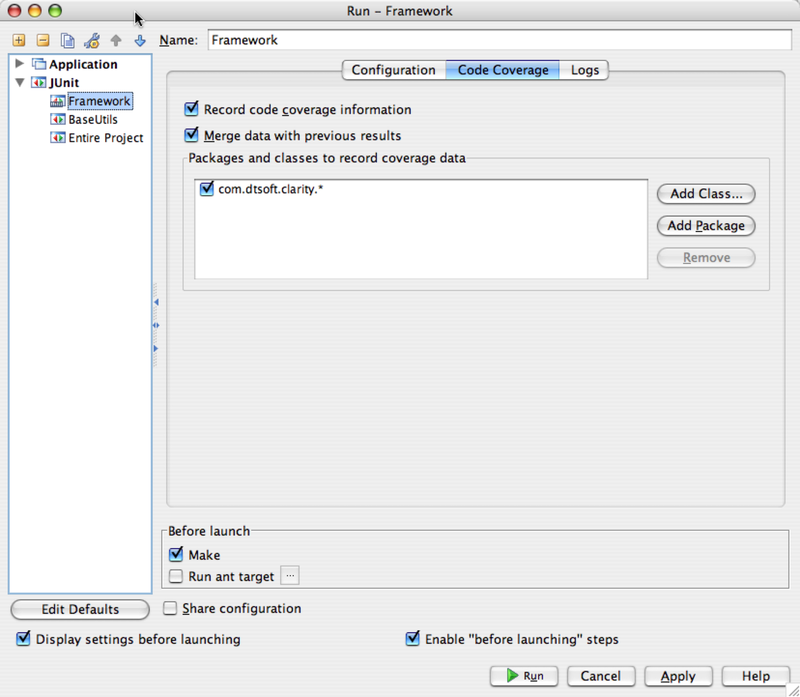 I go into the "Code Coverage" tab of the "Run" dialog and add the package I want to monitor, ensuring that the two check boxes are set (see attachment). I run the project. I then select Analyze | Code Coverage Data and select the coverage data (see attachement). And... absolutely nothing happens. I see no code coverage statistics in the project view nor do I see any highlighted lines in any of my source code files. I've searched JIRA and the forums for some mention of this issue but... nothing. Any ideas what's going wrong? Please examine your left gutter. There should be green/red/yellow markers. is outdated. May be it is your case? Do you see smth like this? latest Java 5 build). I go into the "Code Coverage" tab of the "Run"
lines in any of my source code files. but... nothing. Any ideas what's going wrong? This is under an up-to-date Ubuntu Linux install with Sun's 1.5.0_09 JDK for the project target. Did you try the latest 6.0.2 EAP? Also does your project's name contain spaces in it? Also, the project name does not have spaces in it, and there are no spaces in the rest of the path, either. WP> Thanks for the quick reply. Again, no spaces were in the original path. Let me know what else you'd like me to try. Yes, with backslashes in the path. And you're correct, that misplacing of the data appears to be fixed in 6.0.2. The path printed in the console is still missing the spaces, but that's a red herring. I'm still getting inconsistent results; some of my tests don't seem to be saving any coverage data, but one run just worked fine, so I'll dig into this more. But it's definitely a step forward, thanks. I didn't count, but you have posted this link at least ten times now. to point to the latest EAP version? Is there any reason why not?